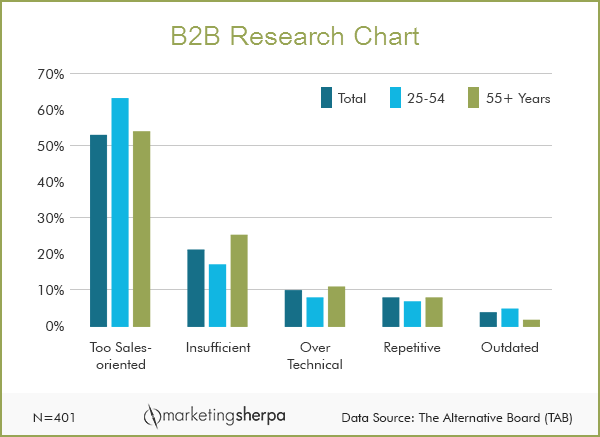 B2B Research Chart: How do prospects really feel about your marketing? SUMMARY: Why is your company losing deals? Perhaps it’s an issue of trust. In this MarketingSherpa Chart of the Week, we'll take a look at results from a third-party survey of 401 small business owners to discover how you can improve your marketing information during the complex sales process. I used to love sitting in on win-loss report interviews. Sure, there was value in finding out why the enterprise software company I worked with won deals. However, there was more value in the losses. After all, loss identifies ways to improve the marketing and sales process. The limiting factor, though, was that this was all based on the sales rep’s opinion. What did the customer really think? Q. When evaluating a new product or service for your business, what is your biggest criticism of the information that you receive directly from the vendor? As you can see, more than half of business owners looked at marketing information as too sales-centric. This sentiment was even more pronounced among the future of the business world, with 62% of 25 to 54 year olds saying that marketing information was too sales-oriented. No longer do companies have control over the information about their products. From social media to easy Web publishing, customers have many outlets to find information about your products and services. As a result, they look at the marketing information coming directly from vendors and their competitors in a different light than they did in the past. Does your marketing information help them make the best decision for their business, or is it just trying to sell them a product, no matter what solution they really need? This unfortunate potential perception can cause you to lose credibility with the customer. How can you build trust with potential customers when they are taking the steps to research and explore potential solutions? 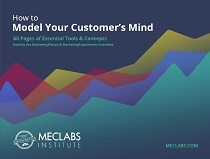 Creating thoughtful case studies of customers that have used your company’s product or service. This should include not only how the product or service was used, but also the bottom-line impact it had on the business. Bomgar, a remote support solutions company, generated a 50% increase in case studies by using gamification to encourage customers to volunteer for case studies. IntelliResponse, a customer service software company, used infographics to communicate its case studies. Vidyard, a software company, created a fictional, storybook video about two potential customers, one successful and one unsuccessful, with a plot twist at the end — the successful customer is real, and, after filling a lead form, you can see her case study. Building a relationship on trust shouldn’t end when the prospect becomes a lead. When a business development rep or a sales team member gets on the phone with potential customers for lead qualification or sales discussions, you must continue to focus on solving their problems. I spoke with our own Kevin Soisson, Manager of Strategic Partnerships, MECLABS, about the data in this chart and how to meet sales objectives without being “too sales-oriented.” He is on the phone every day with marketers to help them determine if a MarketingSherpa Email Summit sponsorship will fit their needs. Soisson has an interesting background, with 12 years of coaching executives how to be better golfers and teaching students through the Dale Carnegie Sales Course. The same executives who are learning to improve their slice on the weekend are looking at your B2B solutions during the week and deciding whether to buy — or not. Soisson translates that same teaching style to the world of B2B sales. “It’s never about the solution I have to offer. It’s always about what the person on the other end of the line is trying to achieve and what is stopping them from meeting those goals. I need to differentiate getting across what is important to me and understanding what is stopping them. Once that is determined, I simply explain our sponsorships,” Soisson said.